Crawford first performed at club gigs from Cincinnati to Saint-Tropez, but made her name in mid 1970s in New York, where she sang with jazzmen George Benson and Cannonball Adderley. She signed with Columbia Records and released her first single, "Knock On Wood" / "If You Say the Word" in 1972. Adderley invited her to sing on his album, Big Man: The Legend Of John Henry (1975). During a brief tenure at Columbia Records, Crawford recorded "Don't Get Caught in Love's Triangle". She is also one of the vocalists on Fred Wesley & The Horny Horns – A Blow For Me, A Toot To You (1977). In 1978, Crawford sang vocals on "Hoping Love Will Last", the opening song on side two of Please Don't Touch!, which was the second solo album by the former Genesis guitarist Steve Hackett. She led R&B veterans the Crusaders on the transatlantic hit "Street Life" (1979). A specially re-recorded version was featured in the soundtrack for the films Sharky's Machine and Jackie Brown, and appeared in commercials in the early 2000s. She later recorded for Warner Bros. Records. Crawford was named the 'Most Outstanding Performer' at the 1980 Tokyo Music Festival. Crawford also recorded the love theme ("People Alone") for the film soundtrack of The Competition on MCA Records in 1980. Her follow-up solo efforts included "One Day I'll Fly Away" (1980) and "You Might Need Somebody" (1981), which became soul standards, and a cover of the Tony Joe White penned, first popularised by Brook Benton, "Rainy Night in Georgia". The album, Secret Combination (1981) stayed on the UK Albums Chart for sixty weeks, after which her profile dipped, despite a return to the UK Top Ten with "Almaz" in 1986. She continued to record for Warner Bros through the 1990s, but was unable to score either a big R&B hit or major crossover success. Naked And True (1995) brought Crawford back to her roots: it included George Benson's "Give Me the Night", and confirmed her soul heritage by featuring Funkadelicists Bootsy Collins, Bernie Worrell and the Fred Wesley Horns. She enjoyed her highest profile of the decade when rising starlet Shola Ama had a worldwide hit with her 1997 cover of "You Might Need Somebody". She has sung with Bootsy Collins, Johnny Bristol, Quincy Jones, Al Jarreau, Rick Springfield, Katri Helena, Michael Kamen, Zucchero, David Sanborn, Steve Hackett, the Spanish band Presuntos Implicados, and Joe Sample amongst others. 1978 : Please Don't Touch! by Steve Hackett - Lead vocals on "Hoping Love Will Last". ^ a b c Roberts, David (2006). British Hit Singles & Albums (19th ed.). London: Guinness World Records Limited. p. 125. ISBN 1-904994-10-5. ^ "Brit awards winners list 2012: every winner since 1977". The Guardian. Retrieved December 7, 2016. ^ a b c d e Roberts, David (1998). Guinness Rockopedia (1st ed.). London: Guinness Publishing Ltd. p. 100. ISBN 0-85112-072-5. ^ Billboard Magazine, Issue 84. Billboard. October 14, 1972. ISSN 0006-2510. Retrieved July 15, 2013. 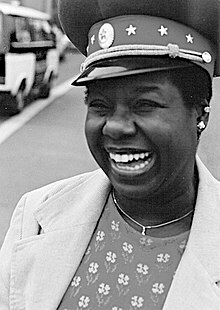 ^ "Biography for Randy Crawford (I)". IMDb. Retrieved July 15, 2013. ^ a b c d e "Biography by Ron Wynn". AllMusic. Retrieved September 8, 2009. ^ "A Blow for Me, a Toot to You - Fred Wesley & the Horny Horns, Fred Wesley - Credits". AllMusic. Retrieved December 24, 2017. ^ Collins, Phil; Banks, Tony; Gabriel, Peter; Mike Rutheford; Steve Hackett (2007). Genesis: Chapter and Verse. Macmillan. p. 186. ISBN 0312379560. ^ Whitburn, Joel (2004). Top R&B/Hip-Hop Singles: 1942-2004. Record Research. p. 140. ^ "People Alone by Randy Crawford - Songfacts". Songfacts.com. Retrieved November 29, 2018. ^ "Randy Crawford / Lalo Schifrin - Love Theme - The Competition (People Alone)". Discogs.com. Retrieved November 29, 2018. ^ "Live From Abbey Road: Show 8". TV.com. Retrieved November 29, 2018. ^ "Randy Crawford - Credits - AllMusic". AllMusic. Retrieved October 23, 2018. ^ "Randy Crawford". Grammy.com. Retrieved November 29, 2018.